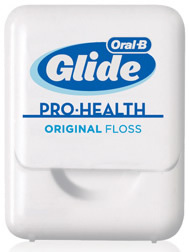 Oral-B Glide PRO-HEALTH Deep Clean Floss (Travel Size) is the #1 recommended brand of dental floss by US Dental Professionals. It is designed to slide easily between your teeth and resists shredding. GLIDE® Floss removes plaque and helps prevent gingivitis for healthy teeth and gums.